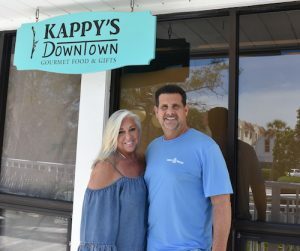 BY SUE ERWIN – Steve and Jill Kaplan, owners of Kappy’s Market at the north end of the island, are opening a new store in town called “Kappy’s Downtown,” and some of its offerings may seem very familiar. “We saw a void when PJ’s closed, and we thought this would be a good opportunity have a presence in town,” Steve said. The owners are planning to offer similar services as The Grapevine did, like a self-serve coffee bar, breakfast sandwiches, coffee cakes and doughnuts, lunch sandwiches, soups and salads. They are even going to honor the coffee club that The Grapevine offered, giving a free cup for every five purchased. There will be a grab-and-go cooler offering yogurts and snacks as well as a cold beverage area. A featured sandwich of the day will be posted on the chalk menu board daily. Gourmet cheeses, crackers and paté will be available for purchase, as well as a variety of wines. Working Cow ice cream will be available by the scoop or pint. Chef Tim Spain’s Key lime pie will also be available to order. A retail/gift area will be located at the front of the store, offering items like cheese plates, mugs, and other tabletop accessories. Ready-to-bake ordered dinner will also be available, but no catering will be offered. They’ve already hired two former employees from PJs: Diane (who worked in the kitchen) and Kristy. They are hoping to open on Monday, Sept. 17 at 7 a.m. The owners plan to keep the restaurant open seven days a week. “We want to give the people what they want, and we want our customers to know we’re willing to listen to their needs and take suggestions,” Steve said. Kappy’s Downtown is located at 480 E. Railroad Ave. in Boca Grande.